Saints Promoting Education Careers (SPEC) will host an evening of holiday stories, crafts and snacks for local children ages Kindergarten-third grade on Friday, Dec. 8, 2017. Each child attending will also receive a free book to take home. The event is from 5:45-7 p.m. and will take place in Room SU 114 E & W (upstairs in the Student Activities Building) on the main campus of Seward County Community College. 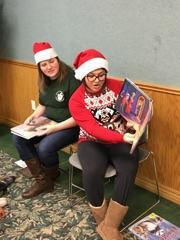 Members of SPEC are education majors, and “Tis the Season” gives them a chance to interact with elementary-age children in a fun environment as well as plan an educational activity, according to Janice Northerns, club advisor. The event is free but limited to the first 50 children to sign up. Parents should make reservations by calling club advisor Janice Northerns at 620-417-1456. Callers should leave a voice message stating name and grade level of each child attending and a phone number. Reservations will be accepted until 4 p.m. Dec. 7, as long as space remains. For more information, call Northerns or email [email protected].